If the Taliban are not responsible for 9-11, then why are we still fighting them? For it to be the longest war in American history, it’s difficult to explain what the Afghanistan War is really about. Just like in Iraq, the reasons used to justify this war have changed over the years because people are either too arrogant or too ignorant to admit a mistake. There really is no clear mission. And it will be virtually impossible for the US government to ever know when “victory” is achieved. An important question remains: Did any Taliban, or any Afghan for that matter, have anything to do with 9-11? The answer is a resounding ‘No’. The 9-11 attackers were Arab, mostly Saudis and Emiratis. The Taliban are Afghan, and have no ethnic relation to Arabs. The Taliban also played no role in 9-11, and were mostly unaware of what al Qaeda had planned from within the borders of Afghanistan. Directly after 9-11, and in response to US demands, the Taliban did offer to give up Bin Laden on condition that America produces evidence showing his involvement in the attacks. They placed this condition because Bin Laden originally denied his involvement. They also distanced themselves from Bin Laden and urged that America investigate the 9-11attacks before it decides to bomb Afghanistan. The US government refused this offer because they had no evidence. Once Afghanistan was bombed, the Taliban then offered to give up Bin Laden unconditionally; where he would be handed over to the OIC (Organization of Islamic Conference) or another third-party. But again,the US refused. This refusal clearly shows that the US was never interested in Bin Laden. The target of America’s attack was the Taliban and their removal from power. This was despite the fact that the Taliban never attacked or even threatened America, or any other country for that matter. This is a difficult concept for many Americans to grasp: How can the people we’re attacking because of 9-11, not know what 9-11 is? How can they not know that over three thousand Americans were killed by non-Afghans over 11 years ago? Don’t they know that we’re defending ourselves by fighting people who never attacked us? Don’t they know that we’re the good guys? If one breaks away from this delusional ignorance and develops a sense of reality, they might come to realize that the Taliban have simply been defending themselves against foreign invaders since the beginning of the war. Maybe this line of thinking will lead to accusations of being an enemy sympathizer or even a terrorist supporter. But it is yet to be seen: What qualifies the Taliban as our enemy, and what justifies the Afghanistan War as the longest war in American history? They governed Afghanistan for only 5 years and never threatened a foreign country. They were one of the poorest and weakest countries in the world, only to be attacked by the most powerful. They may have been violent and harsh to their own people, but they were never violent or harsh to anyone outside of their borders. If 9-11 is an illegitimate reason to justify fighting the Taliban and their Afghan allies, then nothing else can be used to justify the war.. So how did the Taliban come to power? The circumstances surrounding that are complicated and should only be dealt with by the Afghan people. The Taliban didn’t participate in fighting the Russian invaders in the 1980s. However, they did end the civil war that raged after the Russians retreated in defeat. They accomplished this by fighting against rivals and brutal warlords who ruled regions around Afghanistan. Some warlords were defeated by the Taliban; Others were absorbed into the Taliban movement bringing with them their criminal and brutal tactics. Even though they were able to force a cease fire in Afghanistan, their 5 year rule was considered brutal by many Afghans. And the American invasion has only helped the Taliban to reinforce their brutality by giving them a cause to rally around. But they don’t have a monopoly on brutality. It is true that there are elements within the Taliban that justify the killing of innocents, but it’s also true that elements of the American government justify “collateral damage”. They terrorize those who are not part of their alliance, but so does America with its “shock and awe” campaigns and drone strikes. The Pakistan Taliban have now famously attempted to assassinate a 14 year old girl, Malala Yousafazi, who spoke out against them; But America successfully assassinated a 16 year old American boy, Abdulrahman al Awlaki, for being the son of someone who spoke out against America. Neither side has a moral high ground, and neither side can justify its criminal and terrorist activities. Despite how cruel they can be, the Taliban did end the Afghan civil war of the 1990s thus bringing an end to decades of fighting in Afghanistan. As destructive as some elements of the Taliban are towards Afghans, they had solved one of the countries worst problems. But their solution turned out to be just as bad or worse than the problem they solved. Regardless, it is the Afghan people who have to deal with this dilemma, not the American people. If the Taliban are not responsible for 9-11, then why are we still fighting them? Is it that we know what’s best for Afghanistan? 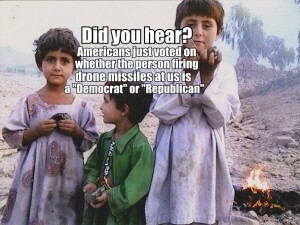 Are our bombs supposed to teach them to be civilized, peaceful and democratic? Or are we trying to create more enemies so that the American war machine will continue to provide jobs? Americans have failed yet again at preventing our government from sabotaging and destroying another country that never attacked or threatened us. American voters share the responsibility of the criminal and terrorist acts of the leaders they elect. These are leaders who authorize foreign policies of death and destruction. It’s a shame that most Americans either arrogantly try to justify these foreign policies, or ignorantly vote for these leaders while thinking that their vote can be isolated into an imaginary box of domestic policies. Afghanistan is for the Afghan people. Let them sort out their own problems, and let them define their country on their own terms. They’ve been fighting invading forces for centuries. And they have a reputation of being one of the fiercest resisters to invaders. They will continue to fight until today’s invaders retreat in the same way that previous invaders retreated. It’s just a question of when will the invaders swallow their pride and acknowledge that “victory” is not theirs to claim. With more than 2,000 American soldiers killed, and over 15,000 Afghan civilians killed, it’s sad that the point of the Afghanistan War is still not known, and depressing that so many Americans are silent about it. This entry was posted on March 10, 2013 at 10:15 am and is filed under Afghanistan, NATO. You can follow any responses to this entry through the RSS 2.0 feed. You can leave a response, or trackback from your own site.